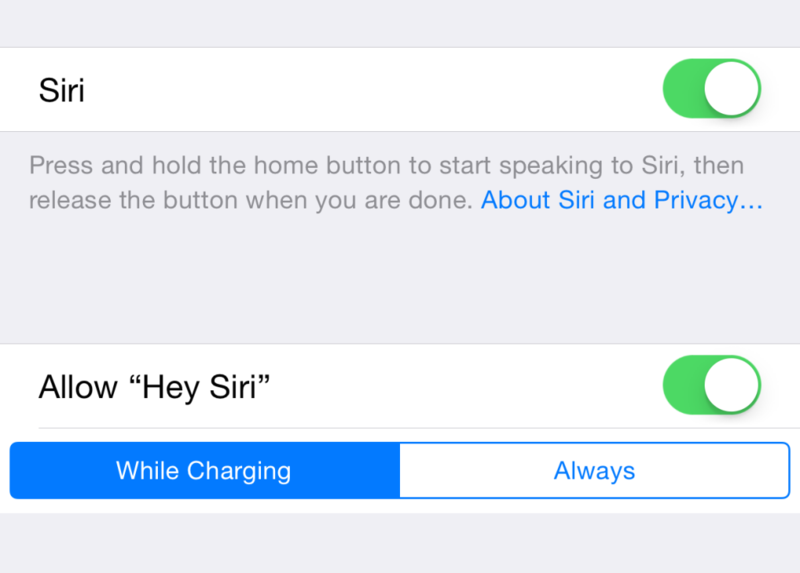 Apple added its own spin on “Okay, Google” with iOS 8, allowing iOS device owners to call on our favorite virtual assistant using a simple “Hey, Siri” voice command. The only problem is that users need to have their iOS device connected to a power source in order for the feature to work – that is, until now. Created by Hamza Sood, a new jailbreak tweak called UntetheredHeySiri indeed allows jailbroken iOS device owners to call on Siri in the above way even when their iPhone or iPad isn’t charging. The option to do so is added to the built-in Settings application: alongside the “Hey Siri” toggle, users of the jailbreak tweak can set the feature to be enabled “while charging” or “always” (as in the above image). Of course, this will clearly impact on your iOS device’s battery life; if your iPhone or iPad is indeed always listening out for Siri’s call, you’ll find that even the iPhone 6 Plus handset’s beefy battery struggles to get through the day. Also, at least in my personal experience, Apple’s iOS 8 often mistakes other words or phrases for “Hey, Siri,” and activates the assistant unnecessarily. In order to take advantage of the jailbreak tweak, you’ll need a jailbroken iOS device running iOS 8 or above. As we explained earlier today, however, while Pangu for iOS 8 hasn’t been the easiest jailbreak solution to use, it does seem to be getting better. You can download UntetheredHeySiri free of charge on the Cydia Store. See also: Brushstroke 2.0 brings iPhone 6 support, new styles, additional colors and more, Konami’s Yu-Gi-Oh! Duel Generation launches worldwide, and Cydia gets an update and is now bundled with Pangu for iOS 8.